We're buying a new home and my wife surprised me by suggesting that I not only get the basement pre-wired, but that I get them to install speakers. Unfortunately, we have to decide everything by tomorrow to meet our deadline for signing paperwork. Anyone have feedback on either iWired or SpeakerCraft? The room is in the basement and is approximately 15' by 25'. The room is not fully enclosed. It has three outside facing walls, and an open floor plan that extends into the rest of the recreation room/bar area. I plan to use the room primarily for movies and sports. So I imagine having friends overs for the games, or watching movies with my family. We're leaning toward putting the speakers in the ceiling (three in the front, two in the back; all 8" round, directional speakers). One reason we're leaning toward ceiling speakers is because we don't know for sure how big of a flatscreen we plan to get. If the speakers are placed for a 90 inch screen but we end up with a 70 inch screen, well, now that would be a problem. We don't plan to use a projector because we think there will be too much light in the room. One other note: I'm not an audiophile. I do like to have great sound and picture, but I don't need it to be perfect. And I don't plan on this being a $10,000 theater. Speakercraft are well known for their inwall/ceiling speakers. Inwall/ceiling speakers are a compromise in placement for sound quality in most cases. It sounds like you might be okay with that compromise. In my basement media room I will be wiring for floor standing speakers in the front/center, sub in the corner and on wall for surrounds. If it were me I would wire for the biggest screen and use on wall or floor standing, it does not hurt at all to have the fronts well apart it actually helps to a point (you don't want them in the corner usually). This has numerous advantages, you get to buy install speakers you like (probably either for less cost or higher performance or both), easy to upgrade/replace later, can spend that money later ( I know how expensive getting into a new house is). Make sure you have the wiring terminated in a closet or somewhere with adequate power and space to house the A/V components (ie receiver, bluray, game console etc.) Make sure if that if it is in a closet you wire for remote IR (receiver in wall with wire to closet for repeater). You sound like you're doing what I did about 4 years ago when I had the house we're in built. My wife said go for it on the man cave as long as it was within reason. So here are some things I pondered and went for after a lot of internal/external debate. Speakers: I decided to not do in-wall speakers. Sure they look nice and out of the way, but I don't know of any theaters that have speakers firing straight down. That being said, I asked the installers to just pre-wire and put plates on the connections. I used banana plugs and just a foot of wire and mounted speakers to face slightly downward since they were halfway up the wall. That way if I ever wanted to get bigger speakers (or smaller ones), than I could do that. I also wasn't obligated to buying just what they had. I found some great Polk Audio's that costed a quarter of what the installers wanted for their in-wall speakers. You said you're not an audiophile, so no need to spend more than what you're ears won't want. Hopefully you have a selection to choose from should you decide to do in-wall. Wiring - Even if you don't plan on getting a projector, is there even a small chance you may at any point in the future? I'm not sure I will, although I have the space if I wanted to. So I had them install a plug and wire tubing in the ceiling, that way if I do get something down the line, the connections are already there and out of the way. For speakers, this is what I did (borrowed from my old thread I started way back when). I prewired for 7.2 sound (I do like my movies to sound great), but I can actually upgrade to 11.2 if I decide to get one of those 4k receivers. Good luck! It's a lot, but fun to do. 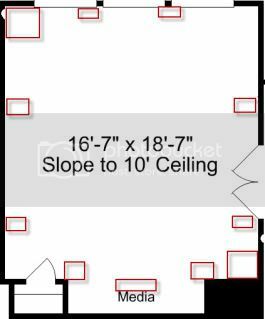 How much sound quality am I compromising with in-wall or in-ceiling? If it's the different between fantastic and perfect, that's one thing, but if it's a substantial, obvious difference, then that's another. I hadn't planned for any of this, so I'm doing a day of research. I'm not sold one way or the other on any of it. But based on the responses so far, I'll probably slow my roll and just go with the wiring just because it's clear there's more research to be done. IMO opinion, there's enough of a sound difference that I didn't want to do it. I also have a Fry's that's local, and they have a demo room that allowed me to hear the difference, which is what sold me on doing the speakers myself and not in-wall. Oh - and for the pre-wiring, make sure you have them install at least 12 gauge, not those really small ones that come in the box when you buy speakers. The small wiring can screw up the speakers if you decide to play something loud, even sports. You can read up to verify. The wiring they offer is 16 gauge. I was planning to be okay with that. Ha, well you're definitely covered for some good large speakers. I blew a speaker out once, well before I had my room built. I did some research and found out the gauge was too small. Lesson learned. It is substantial and obvious to my ears. But that is human nature some people don't care/wouldn't notice. That is why there are endless debates on what sounds good to one person vs another person. I think you are making a better choice in prewiring in the walls and deciding later! Gives you more time to figure out how you really want to do it. I would try to find buddies/friends that have both types of setups in real houses. I have listened to inwall setups and left saying that was not for me! Demo rooms can be very deceiving, good place to start but I wouldn't base my decision solely on that. Oh and I am running monoprice 12 gauge speaker wire. 16 gauge is pretty thin (higher numbers equal thinner wire), workable but I would go at least 14 gauge depending on how long the runs are, if you are going to a closet outside the room its likely 16 gauge would be pushing the limit. But again it comes down to individual needs! My biggest concern on these is that there are very few reviews on them. And the few I read didn't give them all that much praise. I've read some decent reviews of the Aim8 speakers. But no, there's not much out there. I'd second pre-wire. Gives you more flexibility and you can probably find ore for less elsewhere. Example they've been clearance for a while, but these Monitor Audios are probably pretty good at half off (half way down page). Admittedly I'm mot well versed on in wall speakers. If you haven't check out avsforum.com .